Please note 2018 Global Bhagavad Gita Convention occurred in past. 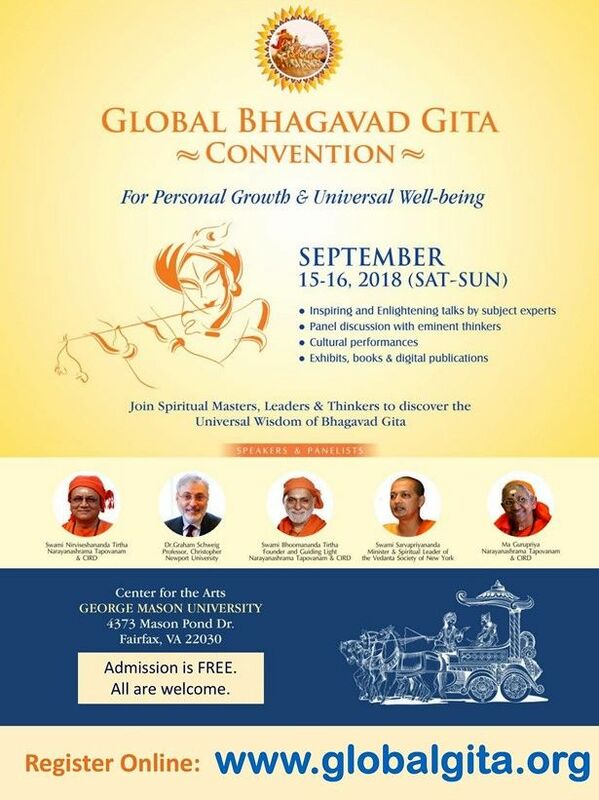 Global Bhagavad Gita Convention (GBGC) will showcase Gita's road-map to accomplish personal and universal well-being through uplifting and insightful presentations by a distinguished group of speakers including professionals, scholars, leaders, and thinkers, who will share with us Gita's timeless wisdom with practical perspectives. The convention promises to be an enlightening and transformative event. The global dialog on Bhagavad Gita is being convened as part of a long-term effort under the inspirational guidance of Swami Bhoomananda Tirtha, a renowned Spiritual Master from India. ?Through a series of global dialog, Center for Inner Resources Development - North America (CIRD-NA) will present the message of Bhagavad Gita as a secular and historical text to all as a universal life manual.